It is said that at one point there were over 7000 temples at Bhubaneshwar, built between the 8th and the 13th centuries in the extravagant Orissan style of architecture. Few remain, however the area is still sacred to Hindus. 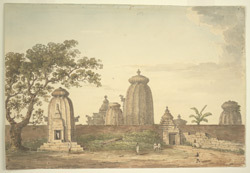 This view depicts an assortment of temples, all consisting of a sanctuary towered by a tall curvilinear superstructure. The complex of the Lingaraja Temple, built in the late 11th century during the Somavamshi period, is the largest and most important of the temples at of Bhubaneshwar.